Originally established as Titicut Academy in 1856, the Pratt Free School was a co-educational institution which catered to the educational needs of the surrounding communities. Nine years later, in 1865, Enoch Pratt of Baltimore, a native of North Middleborough, endowed the school so that local children could receive a high quality education for free. “I make this endowment solely for the benefit of the constant rising generation of my native place”, stated Pratt at the time he made the gift. 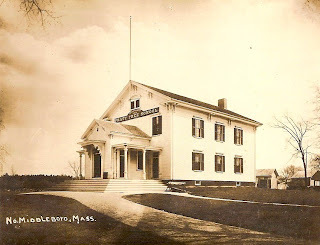 Later, the school was operated by the Town of Middleborough. Pratt Free School, postcard, c. 1910.